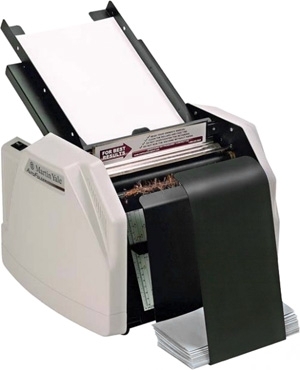 The Martin Yale 1501X Autofolder is a high speed unit that takes a stack of up to (167) 20# sheets and folds them in a snap to many common and adjustable folds. Hand-feeding of multiple page sets can also be performed on this unit. At a fixed operating speed of 7,500 sheets per hour, this machine more than pays for itself. Please keep in mind that this machine is not designed for heavier stocks.